1. 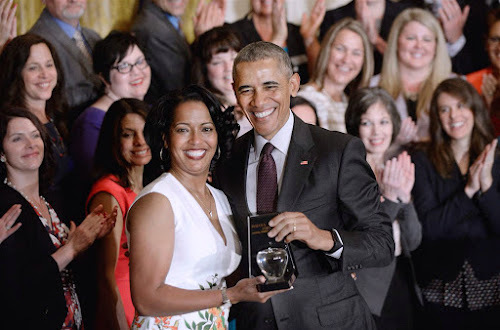 I really enjoyed meeting Jahana Hayes, 2016 Teacher of the Year. 2. Early morning is filled with chirping birds of late. 3. Oh, by the way, SPRING finally arrived in Western Michigan. 4. Ever have to attend a gala like happening and have nothing to wear? 5. I could add many teachers to my Teacher of the Year list. These names come to mind . . . from my past . . .
Helen Foster, high school English teacher, I learned the most. Teaching today . . .
Teachers need our respect, kindness, honor and thankfulness. I am sure you can name some favorites too! Good morning, Lynne! I agree teachers need our respect, kindness and thankfulness. I love the hear the birds chirping early in the morning. Spring is a little slow around here, the weather is chilly and rainy! Happy Friday, enjoy your weekend! I admire teachers, too. I've had many special ones in my life. My sister and her husband were both teachers.The birds are chirping but Spring is taking it's good old time springing..Have a good weekend.. I think teachers nowadays have a more dificult time than in the post as many students have less respect for them, unfortunately. I definitely had my favorites -- Mrs. Stone, Mr. Stroup, Mrs. Ruby... and a whole list of the college profs. What a wonderful teacher celebration! I like this! I was fortunate in elementary and high school to have had excellent teachers - people who were really in a vocation. I blogged about Mlle Giroux, who taught me for two years and left a lasting impression. lynne, your posts are doing that thing again where the feed is showing a new post, but when i click on it , it's not there. i hit your home page just in case but still doesn't show a post for critters this morning. i noticed it a couple of times this past week, too. Lovely tribute to teachers. Spring is about over here (never very long) and we are definitely in a summer pattern. Ugh! I love bird song. Have a great week. I think Spring got lost again since I saw snow flakes on Saturday. I am ready for a little warmth. So blessed to be considered one of the greats in your opinion! Lots of love right back to you!